Sometime in the first or second millennium before Christ, there was a pharaoh in Egypt, and this pharaoh was having the same bad dream over and over, night after night. It was one of those terrible fever dreams, like the kind you get when you have a virus, and the pictures of the dream keep coming into your head until you wake up in a sweat to vomit. 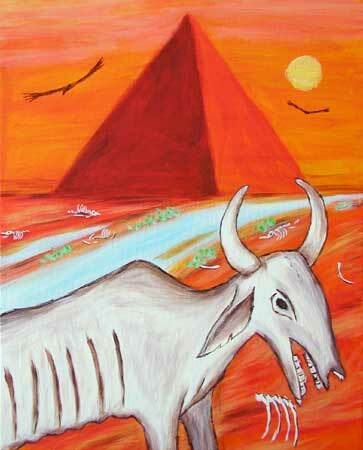 In this dream, Pharaoh saw seven fat cows come up out of the river Nile. They came up out of the water and walked right into Pharaoh’s court amongst all the people like they belonged there. These cows were nice and fat, and their hides had been rubbed with butter and perfumed, so it really was like they belonged in court. Then Pharaoh saw seven more cows come up out of the river. They also walked into the palace, but these cows were thin and diseased. Their mouths were full of broken yellow teeth and ulcers, and their bodies were like old hides stretched over bones. They were skeleton cows. As they entered, women began to shriek, and tables were overturned as people tried to get away from them. Then the skeleton cows began to eat the nice fat cows, and the site was terrible. There was blood and entrails pouring out onto the white marble floor, and the people began to vomit at the sight of it. The guard beside him falls to the floor convulsing. All are overcome. Pharaoh tries to stand to leave the room, but he cannot move. He starts to scream and wakes up. It was the same, night after night, and Pharaoh was troubled. Like most ancient kings, Pharaoh kept sorcerers, priestesses and wise men of various types in his court for interpreting the meaning dreams and other oracles. Many of the these soothsayers came from conquered peoples, and so their status was always in doubt. They survived the politics of court simply by their ability to give good advice and not say anything foolish, and they were very competitive with each other. Pharaoh told the court the story of the dream and challenged each of the soothsayers to divine the meaning of it, and more importantly, what to do so that the dream stopped. The court could see that Pharaoh was very troubled by the dream, so it quickly became a contest. Naturally most of the interpretations were negative because no one survives as a soothsayer without being perceptive enough to at least read the general tone of a situation, but none of them seemed to say anything new. Each interpretation failed to impress Pharaoh in a way that he couldn’t put into words. All seemed to be lacking in insight, and it was as if they failed to see the urgency of the dream. This was no attack by the Hittites, no conspiracy in the temples. This was different. The guard slowly stepped out from the shadow of the column and walked to the center of the floor and stood beside the shaking steward. Clearly the guard was almost as terrified as the steward now. Both stared directly at their feet. “Well, what is it?” Pharaoh said. “Guards!” Pharaoh shouted, “Guards! My chariot!” Pharaoh had the steward by the wrist and pushed him to the door. “Guards! Guards! Come now. Unbolt this door!” Pharaoh beat on the door with his own fists. They weren’t coming fast enough. Pharaoh kept beating the door and calling them. The steward joined in, beating with his bare knuckles. He too called the guards like sheep or children. It was unbelievable. There was the sound of running in the hall, the clink of swords and metal, and the sound of the heavy bronze bolt falling clear of the latch. The doors swung open, and there stood the entire watch with swords drawn. Pharaoh grabbed the steward’s wrist and pushed him through the mass of guards without regard to form or etiquette. Within minutes, Pharaoh had pulled the steward into his own chariot, and they were streaking out across the desert. An entire caravan of guards raced behind, but they couldn’t quite keep pace. Pharaoh had the driver whip the horses beyond what was safe or practical. He was determined to find this foreigner and know the meaning of the dream before the sun set. When they arrived at the gates of the prison, they were covered with dust, both the steward and Pharaoh in his fine linen. The chariot and Pharaoh’s standard were also covered with dust. There was no reason for those inside to think that this was anything but a new arrival. Besides, there was no precedent of anyone of any importance to visit the prison. Without question this was a new arrival and new arrivals at the prison were always a subject of intense anticipation. Perhaps the new inmate was a recent casualty of court politics, a noble recently fallen from grace, a man who had never known work before. The inmates knew how to welcome such people. They picked up rocks and mud and feces and waited directly inside the gate. Pharaoh did not wait for the guards or even his driver. He grabbed the arm of the steward and pushed him through the gates. A roar went up from the crowd, then silence. The inmates dropped their rocks, their mud and feces and fell to the ground, as did the prison guards. Compared to Pharaoh’s guards who now swarmed through the gates, the prison guards were hardly distinguishable from the raggedy convicts anyway. All were silent. “Lord, here I am.” A youth at the back of the crowd stepped through the crouching prisoners and came to stand before Pharaoh. Emaciated and dressed in rags, he looked totally ordinary in every way. Surely this man couldn’t have the answer, could he? “Is this the man?” Pharaoh asked the steward. Pharaoh considered the advice, marveling at what a day it had been. And with that, Pharaoh lead Yasef out through the gates to the waiting chariots, and they raced off in a cloud of dust, followed by the steward and the guards. Then it was quiet, except for the sound of the dry east wind rustling through the dry desert scrub.